Just when we thought it was down to Facebook versus Twitter for the social networking title, Google has jumped into the race with Buzz, a new social sharing service for Gmail users (there are around 176M worldwide, compared to 400M Facebook users). Google Buzz allows users to turn Gmail contacts into a social network and post status updates, photos, and links (like Facebook) but according to a one-way follower model (like Twitter). While this latest move by Google is certainly attracting a lot of buzz (sorry, I couldn’t resist), they will need to address some pretty big hurdles in order for Buzz to be viable. 1. Privacy: Google faces same privacy challenges that crippled MySpace and Orkut. One of Facebook’s key innovations that allowed it to break away from earlier generation social networking sites was privacy controls that allow users to manage who sees what information. Google error: When Buzz launched last week, it automatically added top Gmail contacts to your follower list, even though these might be your coworkers, boss, or others you don’t want to share information with. Google is also confounding the “friends only” model on Facebook with the public model of Twitter, so people aren’t quite sure what to expect. The fix: Following an initial uproar, Google has taken steps to add greater security options. But people are still freaked out, and it will take time to win them back. 2. Usability. To be honest, I was expecting something sleeker from Google, which I know for a fact has some of the best usability designers in the world. I want to see what’s going on “at a glance”—that is, more AJAX, fewer clicks and less scrolling. Google error: Each “buzz” (especially if there is an image) takes up too much of the screen and it’s a pain to have to scroll down to read each one. Once again, it’s trying to be both Twitter and Facebook, but the models don’t jive. The fix: Buzz needs to either 1) adopt the Facebook model in showing you a rich update with images, video, and/or link, hide comments by default, and use an algorithm to just show a subset of everyone you are following, or 2) show every tweet like Twitter but keep it simple, text only, and limited to X number of characters. The usability falls apart when you try to combine rich updates and rich commenting with showing every update, because no one has that kind of time. 2 buzzes take up my entire screen. The same amount of space would fit 5 Facebook status updates or 10 tweets. 3. Not a great track record with social technologies. After an early and valiant, but ultimately unsuccessful, social network play with Orkut.com, Google last year unveiled a number of (perhaps overly) forward-thinking collaboration features with Google Wave. No one disagrees there is plenty of potential, but then again a lot of people I have talked to and I myself feel it is too general to just suddenly start using in a serious way (so we haven’t, yet). Undoubtedly, Buzz is a step toward Wave. 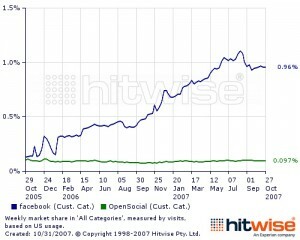 And then there was Google OpenSocial (later spun out as an independent nonprofit) which launched in 2007, also in a big hurry, at the time to compete with Facebook Platform. 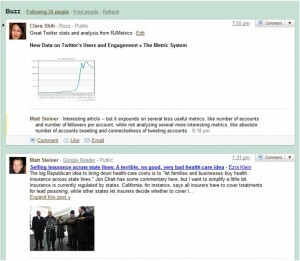 OpenSocial largely has not lived up (yet) to its promise of connecting multiple sites and networks. And then there is Google Latitude, which is cool in theory, but for all practical purposes I don’t really care about the latitude and longitude of my friends and would rather not tip off any stalkers. Foursquare, Gowalla, or Loopt offer a much better experience. All great ideas with great intentions, but poor execution. I’m not hating Google (I would never do that—they gave me my first job). Nor do I question their might or determination. They are taking the right steps, and all of us as consumers will ultimately benefit from the innovation that results from competition. But especially with sensitive information and interactions on the social web, the devil is in the details, and so far Google has been rushing their products a little too much to pay attention to the details. Google’s opportunity: 1) use email contacts as a more accurate and up-to-date implicit social graph, compared to the Facebook/Twitter/LinkedIn social graphs which are all explicit (must initiate/accept each connection), 2) weave together a much richer social experience across a lot of applications including mobile, maps, search, email, Youtube, Picasa, Google Reader, and 3) mesh multiple communication modes including voice, chat, email, status updates, documents/spreadsheets. Takeaway for marketers: it’s probably too early to get serious about Buzz. I’d give it at least a year. I will be staying tuned and keeping all of you posted. This entry was posted on Thursday, February 18th, 2010 at 7:02 am and is filed under Uncategorized. You can follow any responses to this entry through the RSS 2.0 feed. You can leave a response, or trackback from your own site.